Do you want to learn Hungarian from the first step? Learn the most basic words with us! Get to know this very difficult but beautiful language! Saying “happy birthday” to your Hungarian friend? No problem! Hungary is a republic of Central Europe surrounded by the Dinaric Alps, the Alps and the Carpathians. The capital is Budapest which is at the junction of two cities that are in the Danube river. Buddha stands on the right side and Peste on the left side of the river. The Hungarian language , also known as Magyar is spoken by more than 14 million people. It is the official language of Hungary and is considered a rather complex language, although Hungary in the center of central Europe, its dialect is quite different from neighboring countries. It is a country with about 9.8 million inhabitants. The surrounding areas that are part of the Kingdom of Hungary , which includes countries like Austria, Croatia and Slovenia, house about 2.2 million Hungarian speakers. This language derives from Asia, from the Ularic region. Did you know that there are 14 vowels in Hungarian alphabet? There are 9 variations "á, é, í, ó, ö, ö, ú, ü, ű" on the basic vowels "a, e, i, o, u". The pronunciation of each vowel is slightly different and can completely change the meaning of a word. Did you know that the longest word has 44 letters? The word is: Megszentségteleníthetetlenségeskedéseitekért , and means "by improper attitudes". 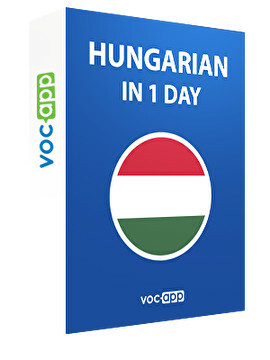 With this course, basic hungarian , you will be able to learn Hungarian by yourself . You can manage your time and learn at your own pace. With the help of flashcards it will be easier to memorize and learn to speak Hungarian . This course is a way to learn Hungarian in a fun way. You will have access to varied hungarian vocabulary , you will be able to learn the most used Hungarian words , basic Hungarian words and Hungarian phrases . With this learn Hungarian app , you will not lack reasons to learn Hungarian in a practical and intuitive way. Learn Hungarian may seem an impossible task, but thanks to our memorizing system, it is easier to memorize Hungarian phrases , Hungarian words , thanks to the selection that the Vocapp team made of the most used Hungarian words .